Hey, isnt that the horse from Horsin Around? BoJack Horseman is an animated Black Comedy-Drama Sitcom series created by Raphael Bob-Waksberg for Netflix as the service's first animated original program. The show premièred on August 22, 2014, and stars an Ensemble Cast which includes Will Arnett (Arrested Development), Amy Sedaris (Strangers with Candy), Alison Brie (Community), Paul F. Tompkins (Mr. Show), and Aaron Paul (Breaking Bad). Set in a world where Petting Zoo People coexist with humans, the eponymous BoJack Horseman (Arnett) previously starred in a popular Sitcom, Horsin' Around, in The '90s. 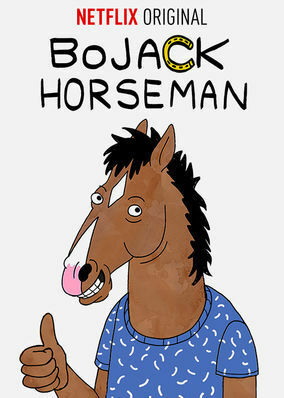 Now a washed-up actor, BoJack lives in his luxurious Hollywoo (sic) home with his deadbeat roommate, Todd (Paul), drowning his empty former D-List celebrity life and other problems in a cocktail of drugs and booze. Clashing with his agent and on-again-off-again girlfriend, Princess Carolyn (Sedaris), BoJack is pushed to finish his memoirs to help him find any acting work. Unable to write but desperate to be famous again, BoJack meets with ghost writer Diane (Brie), whom his publishing company has hired out of sheer impatience. As BoJack begins to open up to her, he not only begins facing reality without the help of drugs and drink, but he also gets to know Diane as much as she knows him; this complicates the situation considering Diane is dating BoJack's (self-proclaimed) best friend and happier counterpart Mr. Peanutbutter (Tompkins). BoJack Horseman is one of the early examples of the auteur sitcom, where a situation comedy format is used to tell more dramatic, existentialist stories while still being ostensibly a comedy. The show most notably breaks the mold of its contemporaries, trading an abundance of shock value, celebrity pot-shots and occasional cutaways for character-based humor and recurring arc jokes. Also notable is its gradual Genre Shift towards Dramedy as BoJack is forced to overcome things like crippling loneliness and narcissism while dealing with the emptiness of being a celebrity and unrequited love. Despite an initially mixed critical response, BoJack Horseman was popular enough to warrant a far more well-received second season, which premiered on July 17th, 2015. A third season premiered on July 22nd, 2016, to additional critical acclaim , resulting in a fourth season being immediately greenlit and eventually premiering on September 8th, 2017. Less than two weeks later, on September 21st 2017, a 5th season had been greenlit, and was released on September 14th 2018. On October 30th, 2018, it was announced that Bojack had finally been picked up for a Season 6. It will also be airing on Comedy Central starting on September 26th, 2018, making it the first Netflix original series to be syndicated for U.S cable television.note Though it wasn't the first Netflix original to be syndicated to television. House of Cards (US) was syndicated to Canadian station CHCH Hamilton in Fall 2017. The title character also has a Defictionalized website maintained by the show's creators. Now has a Recap page and a Best Episode Crowner. .